While praying each decade of the rosary, meditate on some aspect of the mystery and apply it to your own life. This mystery focuses on the Angel Gabriel telling Mary that she is to be the Mother of God. Picture the scene: a person, who Mary has never seen before, comes to her, a young girl (probably no more than 15 or 16 years of age). He tells her that she will bear a child. How does she respond? Though she does not understand, she does not challenge. She simply asks, “How can this be? I have never been with a man.” She is told that the Spirit of God will overshadow you and your child shall be called the Son of God. 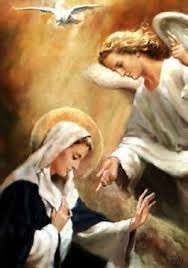 She simply gives her fiat, her acceptance, “Let it be done, according to your word”. How do we respond to God’s will? Do we try to know it? The words of her mysterious visitor are coming true, she is with child. Not having been with a man, she knows that there is something special happening inside her. The words “Son of God” must have echoed in her mind again and again. Her cousin, Elizabeth is also six months along with child. Unhesitating, Mary travels to the house of Elizabeth, to help her with the chores of cooking, cleaning and getting ready for her nephew, John. How would we react? Would we be thinking of others, in that situation, or of ourselves? Her time is nearing for the birth of her child. In a seemingly separate event, everyone had to go to the city of their forefathers to enroll in a census. Joseph, being of the House of David, had to go to Bethlehem. In so doing the words of the prophet, Micheas, would be fulfilled, “And thou Bethlehem, the land of Juda, …out of thee shall come forth the ruler, who shall rule my people Israel.” Things happen in our lives, how do we respond? Do we cave in to them? Do we lose our trust in God? Can we bow our head and accept these, still trusting in God? According to the Law of Moses, every firstborn male had to be presented at the temple, and consecrated to God. Mary and Joseph, fulfilling the law, bring their son. Jesus, though NOT subject to the law of Moses, permits it, to teach obedience to the law. Simeon, recognizes the Child, as the one he has been waiting for his whole life. And prays, “Now you can dismiss your servant, in peace. My eyes have seen the salvation of the world”. He tells Mary that her soul will be pierced by a sword. To what extent, do we obey the law? Do we measure, in our own mind what is important, and what isn’t? When Jesus is twelve years of age, the family travels to Jerusalem for the Passover. You can almost envision the excitement, the crowds in and around the temple. As they travel home, mingling with their friends, each assumes that Jesus is with the other. When they discover their mistake together they retrace their steps. For three days they search for Him. Can you picture their anxiety, their worry, their fears, their feelings of guilt? How would we react? How much finger pointing, raised voices, anger, and disappointment would we be experiencing under these same circumstances?